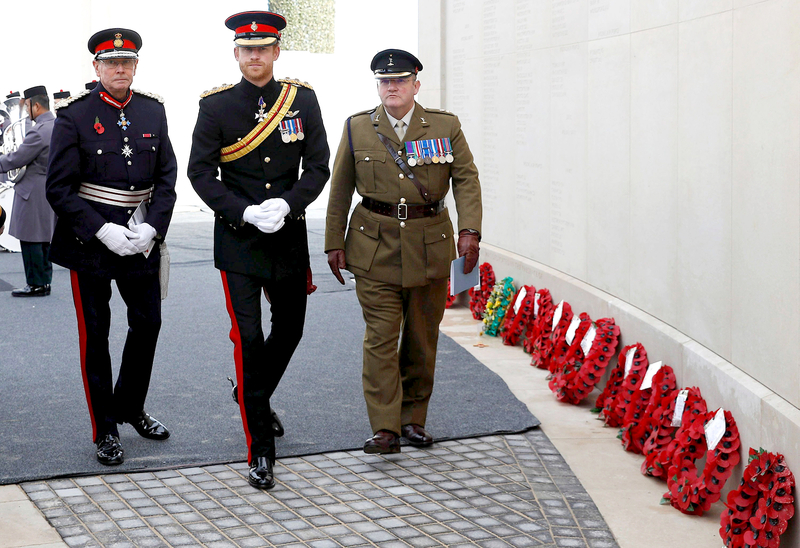 Royal duties came first for Prince Harry Friday, November 11, when he led the U.K. in remembering the country&apos;s fallen heroes on Armistice Day before laying a wreath at the National Memorial Arboretum. 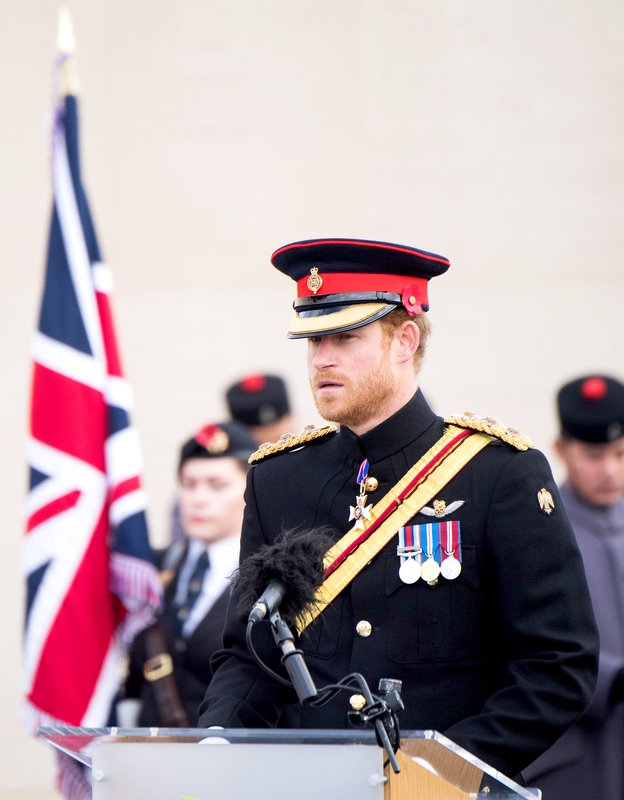 Harry — who served for 10 years in the army and was twice deployed to Afghanistan — traveled three hours from London to Staffordshire to attend a remembrance service alongside veterans and representatives of the British Army, Royal Navy and RAF. Wearing his Household Cavalry No. 1 dress uniform, the 32-year-old prince read aloud an emotional poem, "The Soldier," by the World War I poet Rupert Brooke. 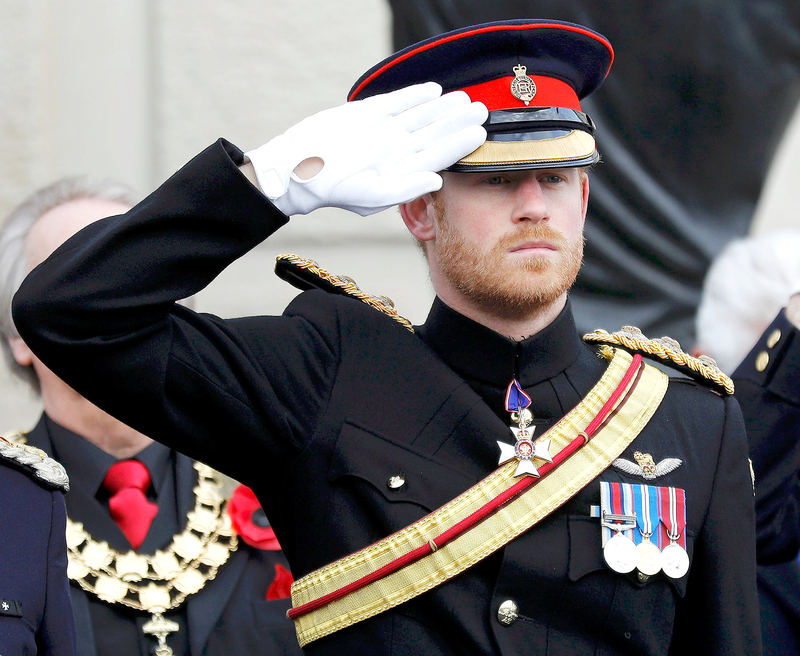 After people across the U.K. observed an annual two-minute silence for fallen heroes, Harry then saluted during a parade of active personnel and veterans, which concluded with a dramatic flyby of helicopters from the Defence Helicopter Flying School at RAF Shawbury, where both Harry and Prince William once trained. Harry was also shown some of the 16,000 names of those lost during active service since 1948. Afterward, he noticed a group of schoolchildren standing nearby and went to say hello. "Are you having a day off school?" he asked them with a grin. "Who sat on the back seat [of the bus]? Is that still important? And did you have a sing-song?" With girlfriend Meghan Markle currently staying at Kensington Palace, Harry promptly left the engagement when it finished at 12:45 p.m. and made his way back to London. Us Weekly exclusively reported that Markle, 35, arrived in the British capital earlier this week and is staying at the prince&apos;s two-bedroom Nottingham Cottage abode, which is nestled in the grounds of the royal palace. Markle has kept a low profile since arriving, but it didn&apos;t take long for the Suits star and philanthropist to be spotted. British TV presenter and radio DJ Chris Evans told listeners of his BBC Radio 2 breakfast show on November 11 that he had bumped into the actress while she was out shopping in Kensington the previous day. "I nearly ran into her yesterday lunchtime," Evans said. "I was running, doing one of my shuffles, and she came out of this shop and I literally nearly ran into her. I couldn&apos;t believe it. I thought it was Pippa Middleton at first, and I thought, oh, there&apos;s Pippa Middleton, and she sort of looked up and then looked down quickly." Markle and Harry have been dating since meeting in June, and friends say the pair have quickly become "very serious" about each other. Earlier this month Us Weekly reported that Harry recently flew to Toronto to stay at Markle&apos;s home, where they spent several days cooking, watching movies and meeting her closest friends.